Anyway, despite the lack of work, Rolo turtles are actually amazingly delicious. Of course, so is eating a Rolo straight from the package. But that wouldn’t count as “baking from scratch” now, would it? Preheat oven to 350 degrees. On a cookie sheet, place 24 pretzels about 1 inch apart. Set one Rolo on top of each pretzel. 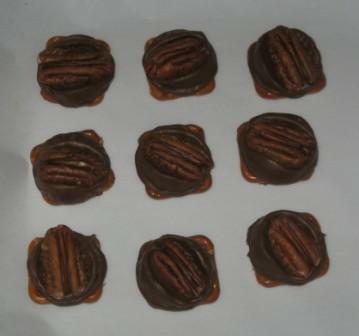 Put cookie sheet in oven until Rolos are soft (about 1 or 2 minutes). Remove sheet from oven. While still warm, press pecan-half into top of Rolo. Let candy cool for 30 minutes before eating (ha!). Finally, take a well-deserved break. This recipe makes two dozen turtles. Ok, so you will need to double the recipe because you will stand there and eat all of the candies before you serve them, but what can you do? Wow your friends at the next Christmas party by serving these on anything but a paper plate, or set some out for Santa. Iâ€™m sure heâ€™s tired of sugar cookies and milk by now. This sounds good. Sweet and salty with caramel to boot! I’m going to try them, thanks Dan! I can’t believe you really ate the stuff from the Dollar Store! Remember: NEVER put anything in your mouth that comes from China. With all that Melomine and lead in things it can be dangerous!